As the Summer months approach us, I find it important to prep my skin for the months of no-makeup days that lie ahead. Suffering from blemish prone skin for many years has unfortunately left me with larger pores on the t-zone of my face, in particular my nose and cheek area. I have always struggled to find a product that does anything towards even a slight decrease in the size of my pores, but I have finally found one - just in time for Summer too, woohoo! Clarins Pore Minimizing Serum helps to instantly tighten and purify enlarged pores, minimising their appearance - a miracle product surely?! I apply this serum once a day, in the morning, just before applying my daily face moisturiser. You can also use this product in your night time skincare routine, just before applying your night time face cream (I'm not too fussed about the size of my pores when I'm sleeping so I leave this product out of my night time skincare routine). Although the thought of applying a Serum to oily skin types can freak many people out, Clarins have design this product (and range) for combination and oily skin. As a result of this, not only does this serum minimise your pores all day long, it leaves you with a smooth and matte skin texture whilst controlling shine throughout the day - perfect! So, it does a fantastic job at minimising pores and this products ingredients work wonderfully together too - amazing. 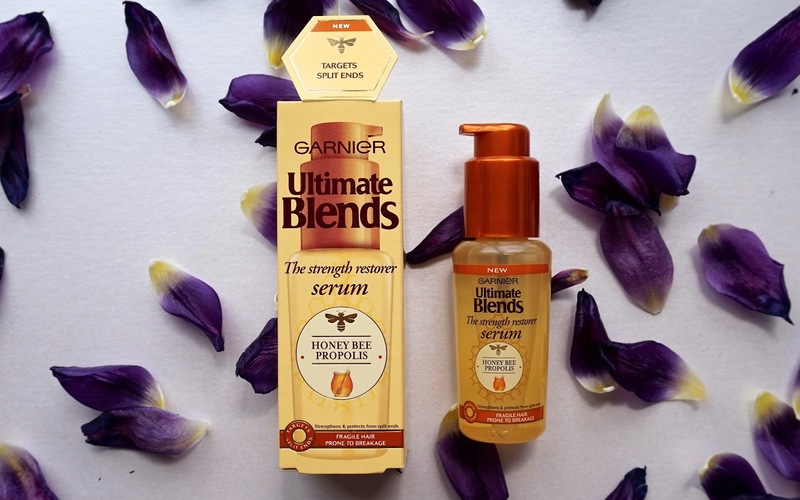 The Hibiscus extract in this serum helps to unblock your pores, before the wonders of the Soft Wheat Proteins tighten the pore walls once they are clear of impurities and toxins. The Clarins Pore Minimizing Serum works well as a base before applying makeup, as well as working great as a solo product in these warmer months too. On hotter days I choose to apply this product to my t-zone (the middle of my forehead, my nose, the top of my cheeks and my chin) after my toner and before my day time face cream, I then leave my face makeup free for the rest of the day and my pores are still smaller by the evening. Tip/warning: This product comes with a pump that can sometimes be stiff to use, be careful to guard it with your hand to ensure you're not applying Serum to the floor of your room as part of your daily skincare routine! We all have our Beauty Favourites, right? But what happens when you're off on a short break or a holiday abroad and you realise you cannot physically take your full sized favourites along with you due to weight/space restrictions? This post includes my top Beauty Favourites that travel around with me and how I manage to fit them ALL in my handbag. 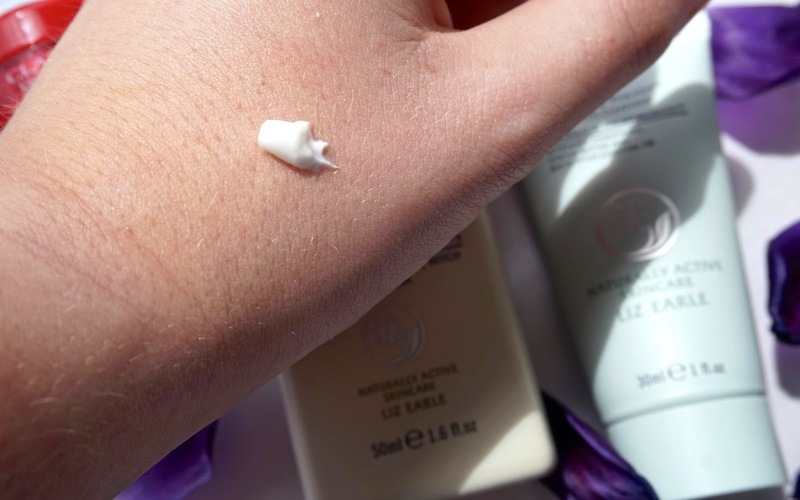 Liz Earle Cleanse & Polish: We all know how much everyone in the Beauty and Blogging world love this product by now and I'm happy to admit I'm one of the many people that use this cleanser daily. Liz Earle have made this available to buy in this travel sized 30ml tube that you can purchase here for £6. An added bonus is that this size still comes with a Liz Earle muslin cloth so even when you are on the go you can thoroughly cleanse your face using the correct application and rinse methods. Cleanse & Polish is a sure winner if you're on a long journey and need to give your skin a brightening and freshening boost (as long as, like me, you travel make up free). Liz Earle Eyebright: The perfect product for those of us that love to nap during our travels. Just like Cleanse & Polish, Eyebright is available to buy in a travel sized 50ml bottle that you can purchase here for £6.75 - this size will last you a lot longer than just your travel days too! This product contains Aloe Vera and Witch Hazel Water which help to revitalise tired and puffy eyes during those long journeys and travel days. It's wonderfully selected ingredients mean it's also non oily on the skin as well as being suitable for easily irritated eyes and contact lens wearers - hoorah! Tip: Be sure to carry a few cotton wool pads with you to use when applying this product to your face. Clarins Toning Lotion (with Iris): This alcohol free toner helps to stimulate and refresh your skin when travelling and on the go. I have chosen to keep a sample sized bottle to refill using the full sized product, meaning it will fit in my handbag and I can take it wherever I go - perfect! I love carrying a toner when travelling, especially on flights. I choose to apply this product whenever my skin is feeling or looking dull from being stuck in a confined place for such a long time. Tip: Take this product on long haul flights and use to freshen up your face after waking up! Clarins Instant Smooth Perfecting Touch: Why take a primer product when travelling with no makeup? This product can help to even out your skin tone, great to pop on your t-zone before arriving to your location to smooth out any imperfections travelling may give you (my face often breaks out on aeroplanes or if I have had a long day travelling). Just like the Clarins Toning Lotion I have chosen to keep a sample sized bottle to refill using the full sized product. Instant Smooth Perfecting Touch is suitable for all skin types and lasts an incredibly long time - a miracle product right?! I love taking this product in my bag when travelling because of it's lightweight texture, meaning my skin is able to breathe without being overloaded with product. Benefit High Beam: A must have travel product - a highlighter. This smaller sized version is available in Benefit's lip and cheek kits and is a perfect size for carrying with you! I choose to apply this just before arriving at my destination as a pick me up for my skin. I apply it on my cheek and brow bones and just down the bridge of my nose to give me a radiant glow, hiding the fact I've been travelling all day - hoorah! Tip: Dot this product on using the brush provided and then lightly blend using your fingertips, be careful not to apply too much - watch out for that fine line between radiant glow and unwanted shine. Benefit Posie Balm: Another must have travel product - a lip balm. I've chosen to include Benefit's Posie Balm as it not only hydrates and conditions your lips whilst you travel but it also contains a tint of pink, perfect for giving those lips a healthy amount of colour. Benefit do these lip balms in 4 shades so if Pink is not really your colour, you can check out the other options here. Benefit Dandelion Lip Gloss: A travel favourite of mine to use just before you finish your travels. After keeping my lips conditioned with lip balm throughout the flight, I choose to apply Dandelion Lip Gloss just before I complete my travels for that added pop of shine on my lips! Just like the travel sized high beam, you can pick up this travel sized Dandelion Lip Gloss in Benefit's lip and cheek kits - travel hero! After such lovely feedback from my Banana and Strawberry Loaf recipe post I have decided to share another recipe with you all here on Bea-uty Blog. Just like my previous recipe posts, I have created this recipe myself using aspects from variety I have found in books/online and a classic 'trial and error' method. These aren't the healthiest of treats, but that's why I make them in mini loaf cases. Per mini loaf, they contain (approx. ): 225 calories, 4g protein, 7g fat and 16g sugar. Quantities: 5 mini Blueberry loaf cakes & 5 mini Blueberry and Apple loaf cakes (using these mini loaf cases). 1. Pre-heat your oven to 200C/180C fan/gas mark 6 and place your mini loaf cases on a baking tray. 2. Cream together the butter and caster sugar, until the mixture is light and fluffy. Then slowly add the eggs (add a little flour if needed). 3. Fold in the remaining flour. Then lightly stir in the milk and vanilla extract, do not stir too much as this will make your mixture heavy. Fold the blueberries into the mixture. 4. Spoon half the mixture into 5 of the mini loaf cases (approx. 2 tbsp of mixture per case). 5. Go back to the remaining mixture and fold in the apple pieces. Now spoon this half of the mixture into the remaining 5 mini loaf cases. 6. Bake for 25-30 minutes, until a skewer/knife comes out clean. Leave to cool for 15 minutes. 7. Mix your icing sugar with warm water (make sure your icing is not too runny to ensure it will stick to the dried blueberries). Top each loaf with the dried blueberries, using the icing to ensure they stay on top of the loaf. 8. Share with guests/EAT THEM ALL. 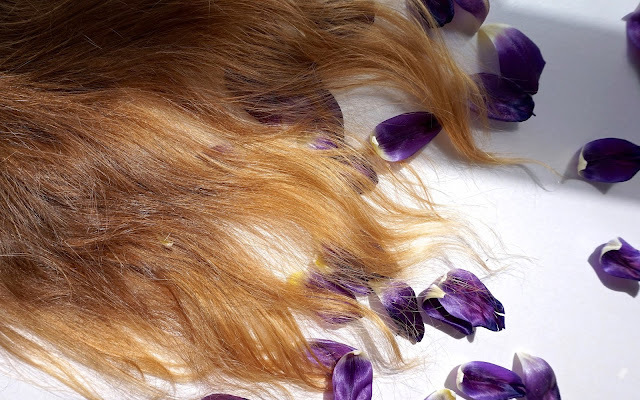 As the Sun comes out and the weather get's warmer, us natural blondes start to notice our hair get even lighter. Great right? Natural highlights without the hair dye? Correct. However, if, like me, you 'suffer' from naturally curly hair too, these effects of the Sunnier months comes with split ends and dried out hair - not so great. My daily haircare routine will always include a split end serum to solve this problem so I couldn't wait to try out this new one by Garnier (find out where to purchase this product here). Of course, I first noticed The Strength Restorer Serum because of it's honey bee related ingredient (propolis - a compound bees make which they use to glue materials of their hives together, showing just how much it can benefit the strength of your hair) - we all know I love products containing honey because of it's wonderful healing properties. This serum aims to provide your hair with defensive properties to help protect it against further 'attack' from split ends and the Sun. So much protection would surely mean a thick and glue-like product right? Nope! The lightweight ingredients of The Strength Restorer Serum means your hair is protected against damage without weighing it down - woohoo! I choose to use this serum after towel drying my hair, before blowdrying. I use one pump of the serum, applying to the ends of my hair and then through the lengths of my hair - I would recommend avoiding the roots of your hair with this product, especially if you find your hair can often naturally gather oils throughout the day leaving your hair greasy. I find this application method protects your hair from brushing damage too - something naturally curly and knotty hair is prone to! Although I choose to apply The Strength Restorer Serum this way, you can also use at anytime on dry hair to smooth the look of split ends throughout the day - great for the warmer Spring/Summer months when those frizzy split ends make a more frequent appearance. Hand cream is always an essential in the months to come - the elements of the Summer months seem to dry them out horrendously. 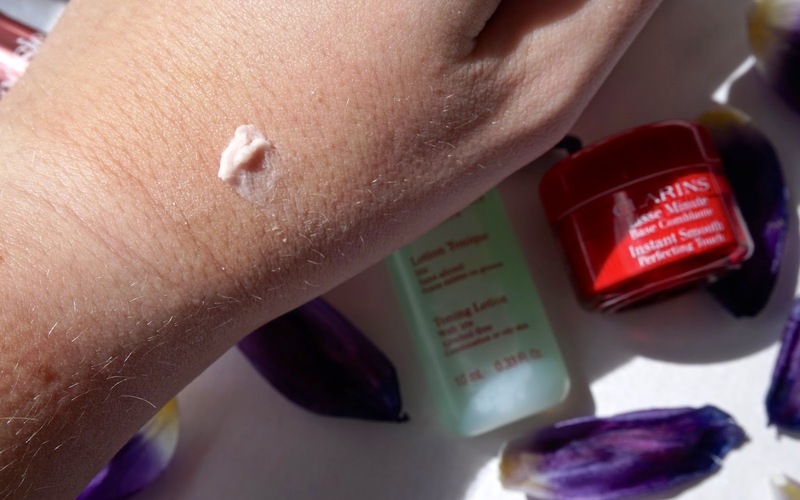 Saying this, finding a hand cream that doesn't linger on your hands for several hours after application, leaving you unable to hold your phone from the fear of it sliding right out your hand, is a tricky task. I know I often rave about L'OCCITANE and their wonderful products - this hand cream fits right in with the rest, some form of miracle. If you haven't already discovered the products in the L'OCCITANE Cherry Blossom range, it's a scent you really need to sample this Spring/Summer. As I've mentioned before, I'm not one to go for over powering florals when it comes to any beauty products, including Perfume. However, the Cherry Blossom range by L'OCCIITANE comes in a lighter scent as well as the intense version of the same florally goodness. After months of carrying around several of their smaller travel sized hand lotions I decided to make a decision and pick my favourite. Cherry Blossom won me over, especially now we're heading in to those bright Spring/Summer months - I had to have a scent to match the weather. This hand cream contains Shea Butter and Vitamin E, meaning your hands are not only moisturised but protected throughout the day too! I choose to apply this hand cream in the morning, using a small amount as swatched in the picture above. Top tip for using hand cream: always start with a small amount and go back for more if needed - nothing worse than too much moisturising, resulting in greasy hands. I also apply this hand cream to my elbows, an area many of us forget about when curing those dry skin patches of our bodies. A light, effective moisturiser with a beautiful Spring/Summer scent - hooray for finding you! It's officially Spring (although the weather here in England is saying different), so it's time to share my current skincare favourites of the Spring months. As the weather gets warmer and the sunset gets later, my skincare routine always changes. The elements of the Spring months cry out for a skincare routine that involves cleansing, uplifting and moisturising products! L'OCCITANE Pivoine Sublime CC Cream: CC (Complexion Corrector) Creams are thought to be the next step on from BB (Blemish Balm) Creams in the industry. This product contains CC pigments and pearly particles that conceal irregularities of your skin and leave you looking healthily luminous - perfect for those bright Spring days! A definite favourite of mine this Spring as I choose to use this CC Cream on it's own for a natural "no makeup" daily look. In addition to this, if you're looking for a fuller coverage, it makes a great illuminating base to your foundation - giving you an uplifting and refreshing finish to your makeup. L'OCCITANE's CC Cream comes in two shades - Light and Medium. These two shades cover a huge skin tone scale as the cream transforms in contact with the skin to adapt to your skin tone - perfection all over! You can find my review on L'OCCITANE's Pivoine Sublime range, including this CC Cream, here. GOOD THINGS Deep Clean Blackhead Exfoliator: Firstly, the combination of berries and other fruits in this products ingredients give it a scent that is out of this world! The perfect uplifting, fruity skincare for Spring months. The tiny micro-beads in this gentle exfoliator have placed it in my daily skincare routine this Spring to keep my skin feeling fresh and clear all day. With ingredients such as soothing liquorice and willow bark, this product helps to keep bacteria away from your skin. To ensure your skin is kept healthy this Spring, GOOD THINGS have added papaya extract to this exfoliator to boost your skins radiance throughout the day - woohoo! Tip: This product is to eliminate the build up of new blackheads, not to get rid of existing blackheads. Liz Earle Cleanse & Polish: Of course, this is still in my skincare routine this Spring. A product my skincare routine cannot live without! As this product is taking the cleansing world by storm, I'm sure I don't need to explain why it's made it into this post. For those of you yet to discover the wonders of this product: Ingredients including Rosemary, Chamomile and Eucalyptus help tone, soothe and purify your skin - honestly, they do exactly that! I use Cleanse & Polish every morning (after using GOOD THINGS Deep Clean Exfoliator) and evening to ensure my skin is left moisturised, fresh and radiant both all day and all night. I would recommend always rinsing this product off using a Liz Earle Muslin Cloth for a thorough cleanse of your skin. CLARINS Exfoliating Body Scrub: The Bamboo Powders of this products ingredients produce the exfoliating action of the natural micro-beads - incredible right?! This product has made it into my skincare routine this Spring 3 times a week (or when I'm braving bare legs in the slightly warmer weather) based on it's incredible results. I'm guilty of forgetting exfoliation during Winter months so by Spring my skin is crying out for effective exfoliation products - hoorah for this body scrub! As well as removing those nasty flaky surface cells, CLARINS Exfoliating Body Scrub contains Liquorice Extract and Shea to soften, condition and protect your skin for days before your next application. An extra wonder of this product is it's versatility surrounding it's application; you can apply this body scrub on to dry or damp skin - a life saver when in a hurry! Just don't forget to rinse thoroughly before applying your moisturiser. Liz Earle Deep Cleansing Mask: The second Liz Earle product to make it into my Spring skincare routine! Of course, my skincare routine has to include a face mask - I use this one once/twice a week, or when needed on breakout areas of my face. The ingredients of this Deep Cleansing Mask, including Aloe Vera, White and Green Clay and Manuka Honey, help to soften the skin whilst removing all impurities - a must for these Spring months! To find out the benefits of these ingredients for your skin head over to my full review of the Liz Earle Deep Cleansing Mask here. Tip: If, like me, you have oily/combination skin this mask will do wonders for maintaining clear skin this Spring! Today's post is slightly different, it's a recipe post. I just had to share this one with you because, look at them, they're the definition of beauty too! I have created this recipe myself using aspects from variety I have found in books/online and a classic 'trial and error' method. These aren't the healthiest of treats, but that's why I make them in mini loaf cases. Per mini loaf, they contain (approx. ): 270 calories, 3g protein, 13g fat (8g saturates), 1g fibre and 24g sugar. Quantities: 5 mini Banana loaf cakes & 5 mini Banana and Strawberry loaf cakes (using these mini loaf cases). 3. Fold in the remaining flour, baking powder and mashed bananas. Then lightly stir in the milk and vanilla extract, do not stir too much as this will make your mixture heavy. 4. Spoon half the mixture into 5 of the mini loaf cases (approx. 2/3 tbsp of mixture per case). 5. Go back to the remaining mixture and fold in the strawberries. Now spoon this half of the mixture into the remaining 5 mini loaf cases. 7. Mix your icing sugar with warm water (make sure your icing is not too runny as you do not want it to fall off your spoon before it reaches the loaf). Drizzle each loaf with a small amount of icing, top with the dried banana chips. I recently realised I needed to restock my go-to toner from LUSH and of course, as soon as I popped in to my local LUSH store, it happened - a LUSH haul. I feel many of you will agree that it is almost impossible to venture in to any LUSH store without picking up several things, rather than just the one essential you went in to stock up on. I picked up these two toners, both in the smaller size bottles as I sometimes like to carry a toner in my bag on warmer days. I like to include two toners that have different ingredients in my skin care routine as it allows me to adapt my routine according to the change in my skin (blemish prone). The Tea Tree Toner Water by LUSH is fantastic for breakouts/oily skin. Tea Tree has many anti-bacterial benefits, great for keeping the bacteria that causes breakouts away from your skin. On top of this, Tea Tree Water by LUSH contains Juniperberry - an additional ingredient that holds antiseptic qualities, helping to keep your skin clear and clean all day. So, it's getting rid of all the nasties we don't want on our faces but what is it giving us? LUSH have cleverly balanced this toner water with Grapefruit - super high in the vitamins your face needs! If my face is relatively breakout free I choose to use Breath of Fresh Air Toner Water, an option with less of the astringent ingredients and more of the refreshing ingredients. Breath of Fresh Air by LUSH contains many ingredients to soothe your skin and reduce redness, great for those warmer months, including Aloe Vera and Rose absolute. On top of these, it also includes Seaweed absolute - great for calming the skin, leaving you refreshed and cleansed all day! I choose to apply both these toner waters by spraying them 4/5 times onto cotton wool and wiping over my face, but you can also close your eyes and spritz directly on to your face (an option that's great to have throughout the day in Spring/Summer). As I'm a complete addict of LUSH Shampoo Bars (you can find my current favourites here), I thought I'd pick up one of their conditioners too. I went for American Cream Hair Conditioner as I've previously used solid conditioners by LUSH and found them too heavy for my hair. The joy of this thick conditioner is the minimal amount you need to apply (I only apply to the ends and through the length of my hair, this avoids greasy roots during the day). Not only does this product's scent of strawberries and cream smell incredible, LUSH use fresh strawberries full of vitamin C to keep your hair healthy. To ensure your hair stays moisturised and protected from damage, American Cream includes Honey in it's extensive list of natural ingredients. Honey helps the hair, and skin, to heal whilst locking in moisture (you can find the benefits of honey for your skin here). I love the smell and benefits of this conditioner but am still needing to use a hair serum to give my hair a boost of shine once it's dry! I'm awfully slow to jump on this bandwagon, I know. But, I thought I should give it a try - some say it works wonders but others say it's overrated! I have often been undecided on how I feel about scented face masks (it's on your face for 10/15 minutes, a strong scent can be highly irritating for that long)! However, Mask of Magnaminty by LUSH has found the perfect balance with it's light and uplifting peppermint ingredient. I choose to apply this mask on just my face but it also doubles up as a body mask, a nice option to have available if you're having a head to toe pamper. A key ingredient in this mask is Marigold Oil. Known for it's benefits of protecting and soothing the skin, Marigold Oil will leave your skin feeling clear of impurities and moisturised when you remove the mask. I choose to remove Mask of Magnaminty using a damp sponge to ensure I remove it all. 13 ingredients in a product leading to the perfect balance for your skin? Woohoo. As well as this, it's thick consistency means application is easy and even all over! Liz Earle - my favourite skincare brand when my skin needs saving. As we enter the Spring/Summer months I wanted to share another Liz Earle product with you all, the Deep Cleansing Mask. I'm a big fan of face masks, using them at least once a week for many months now, so couldn't wait to try this one out! The ingredients of this wonderful mask instantly attracted me. Green Clay and Manuka Honey plus the scent of rose? Face mask heaven. Manuka Honey is well known for it's healing properties, something I love to see in products due to my blemish prone skin. Plus, it's hugely rich in vitamins so is a great ingredient to look out for no matter what skin type you have - woohoo! Enough great qualities just from one ingredient, right? As well as the properties of Manuka Honey this mask has the added extra of Green Clay too - spoilt! Green Clay is well know for it's strong anti-inflammatory properties as well as it's ability to draw impurities and toxins out of our skin - something we all want, especially leading in to those warmer months. I apply this mask after using Liz Earle's popular Cleanse & Polish Cleanser (Mentioned way back in my Liz Earle Favourites post). I love that only a thin layer of this mask is needed, meaning it's quick to apply and last longer than most face masks you may purchase. It is recommended you leave this product on for the usual 5-10 minutes, but sometimes I get distracted and leave it on for 15 minutes so don't panic. Tip: You can apply the mask to your whole face or just to certain areas (if you've had a sudden breakout in only one area, this is a great tip)! Liz Earle have covered all bases, this mask also come's with 2 sponges to remove it! Just dampen the sponge using warm water and use to wipe off your face mask, it really is that easy. Using a sponge to remove the mask ensures you wash off the mask thoroughly (I would recommend rinsing the sponge after every wipe to ensure you remove it all).